Effective recovery from an intense exercise session is essential to perform at your best in the next training session, match or competition. 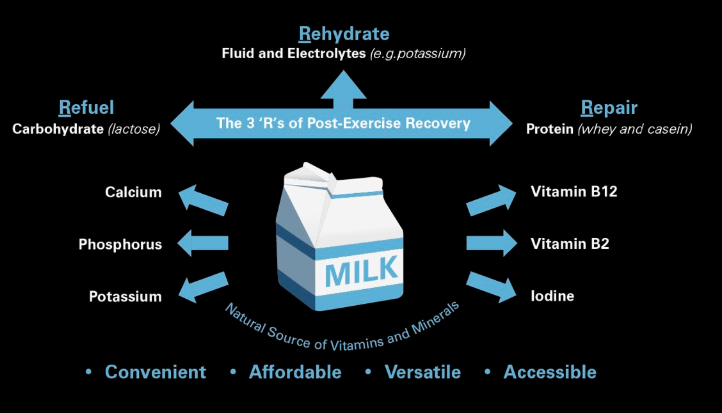 After exercise, there are three main priorities to consider, often referred to as the 3 ‘R’s of recovery: Refuel energy stores; Repair muscles; and Rehydrate. Carbohydrate and protein are the main nutrients to consider: carbohydrate assists with the refuelling of energy stores, while protein plays an important role in muscle growth and maintenance. As the body replenishes carbohydrate stores (glycogen) at a faster rate immediately after exercise, aim to eat carbohydrate-based foods with some protein within 30-60 minutes after exercise to begin refuelling energy stores and assisting muscle repair. Follow up with a substantial meal based on carbohydrate foods such as bread, pasta, rice or potatoes; paired with lean protein sources such as meat, fish or poultry; and include a variety of vegetables to contribute to vitamin and mineral intakes. Hydration - how important is it? Hydrating after exercise is essential for our recovery. However, being well hydrated before a workout can help to make our rehydration strategy most effective. Ensure you are hydrated when beginning a sports session by drinking 1.5-2 L of fluid over the 24 hours beforehand. Monitor urine colour; a straw yellow colour is an indicator of good hydration levels. Drink about 500 ml 2 hours before exercise to allow time to urinate if needed and always bring your own bottle in your training kit. Don’t wait to drink until you feel thirsty. Drink small sips of water at breaks of activity e.g. 100-200 ml every 15-20 minutes. If exercising longer than 60 minutes, a sports drink may be useful to provide carbohydrates and electrolytes; or you can make your own drink by mixing 800 ml of water, 200 ml of sugar-containing fruit squash and a pinch of salt. 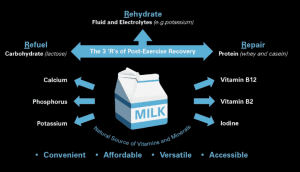 Rehydrate after sport to replace fluid lost e.g. 400-800 ml per hour of exercise completed. Water or skimmed milk are good options. As we lose electrolytes (sodium, potassium and chloride) as ‘body salts’ when we sweat, these need to be replaced by consuming foods or fluids containing electrolytes. For example include a pinch of table salt (sodium chloride) to season your recovery meal; or choose milk which naturally contains potassium.